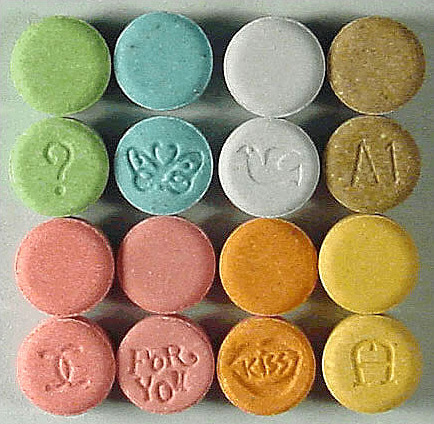 Although the drug methylenedioxymethamphetamine, better known as MDMA or ecstasy, is often lumped into the category of hallucinogens, it has a unique set of effects that make it very distinct from other drugs in this class. Specifically, along with creating a positive mood state and reducing anxiety, MDMA is known for fostering strong feelings of empathy and compassion. In some ways, MDMA appears to act on the brain in a manner similar to other amphetamines. Specifically, it is taken up into neurons and promotes the release of neurotransmitters like serotonin, norepinephrine, and dopamine. This excess neurotransmitter release is associated with alertness and a positive mood, along with the desire to continue using the drug. But the mechanism underlying MDMA's ability to create feelings of empathy is still somewhat unclear. Some have suggested that enhanced compassion during MDMA use is due to increased release of oxytocin, a hormone synthesized by the hypothalamus. In addition to its roles in childbirth and breastfeeding, oxytocin has been dubbed "the love hormone" because it seems to increase trust, promote social bonding, and foster compassion. In a study published this month in Nature Neuropsychopharmacology, researchers compared the effects of MDMA and oxytocin (in the form of a nasal spray) to see how similar they really are. Over a series of 4 sessions they gave MDMA, oxytocin, or placebo to a group of 65 MDMA users and then administered a series of tests to determine the overlap between the effects of MDMA and oxytocin. They found that MDMA caused users to report feeling friendlier, more insightful, and more likely to enjoy social interaction. Interestingly, it also increased feelings of anxiety (perhaps because the participants were forced to experience the drug alone and it is a drug that increases the desire for social affiliation). On a task where participants were asked to identify angry, fearful, happy, or sad emotions in computer-generated faces, MDMA decreased the ability to recognize anger or fear. Thus, the effects of MDMA corresponded to what has been seen before in that it generally promoted positive feelings, sociability, and a decreased awareness of negative emotions in others. The effects of intranasal oxytocin, however, were more ambiguous. It mildly increased reports of positive feelings, only impaired the identification of emotion in faces when it came to recognizing sadness (and this effect was only seen in female participants), and didn't influence the desire to socialize. Also, while the effects of MDMA increased with dose, the effects of oxytocin were inconsistent, with some effects being increased at the lower dose and reduced at the higher dose. Overall, MDMA and oxytocin administration didn't result in similar effects in this study. One major shortcoming of the study was that the experiments were conducted with previous users of MDMA; a previous history of MDMA use certainly could have influenced the experience participants had with MDMA administration (and with oxytocin administration if there really are similarities between the two). However, there is also a lot we do not know about oxytocin and its effects on empathy and sociability. Whenever we give a moniker like "the love hormone" to something like a hormone or neurotransmitter we are chagrined to realize some years later that the actions of that substance are far too complex to preferentially attribute one function to it. The same may be true for oxytocin.